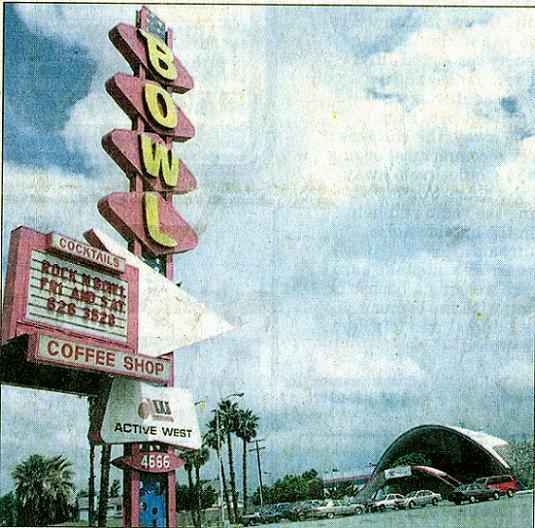 Covina Bowl, the subject of a column and a blog post last year, is closing after being open since 1956. This bowler is sad. 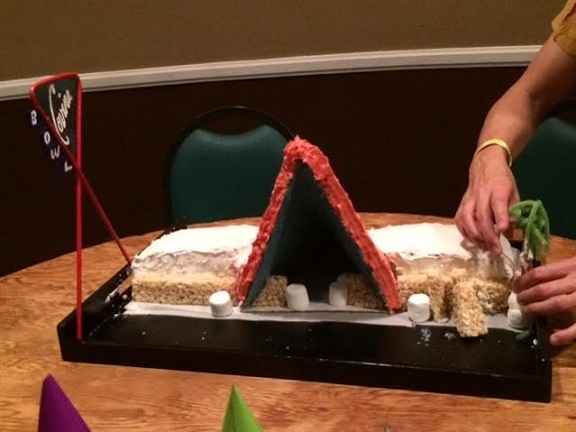 The bulk of Wednesday’s column is about a farewell event that took place last weekend; the center closes Sunday. 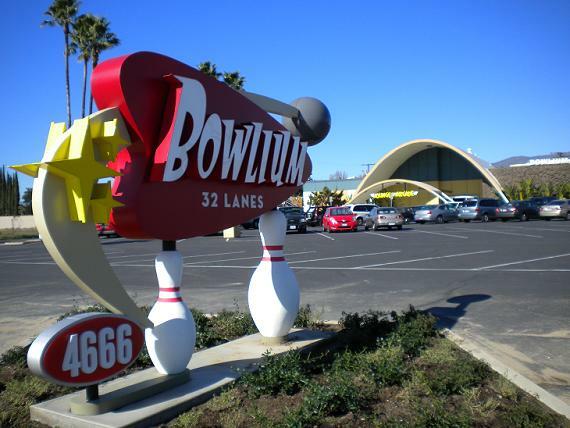 Covina Bowl is one of the area’s granddaddies, built during bowling’s boom in 1956 and still in operation. It just turned 60. 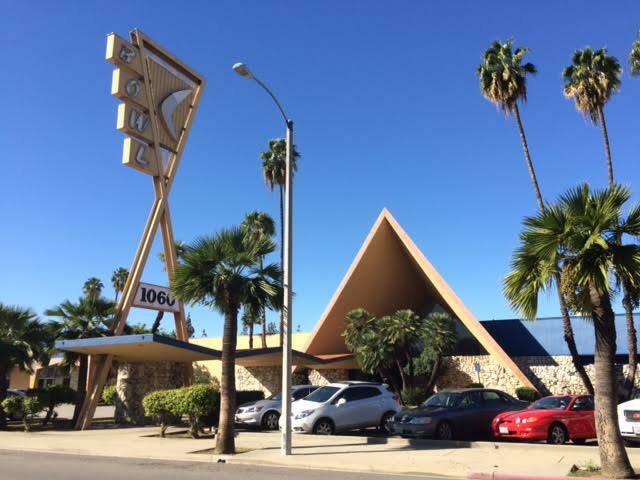 Much of the center is original, with flagstone cladding, a 60-foot sign, oddball Egyptian and Polynesian touches and some evidently original lamps. After the party, I bowled two games, although I’m not a fan of cosmic bowling, which is what was going on that night. 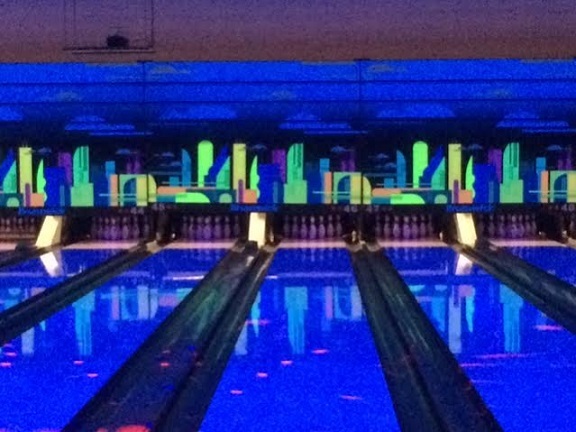 The lanes seemed to be in good condition. 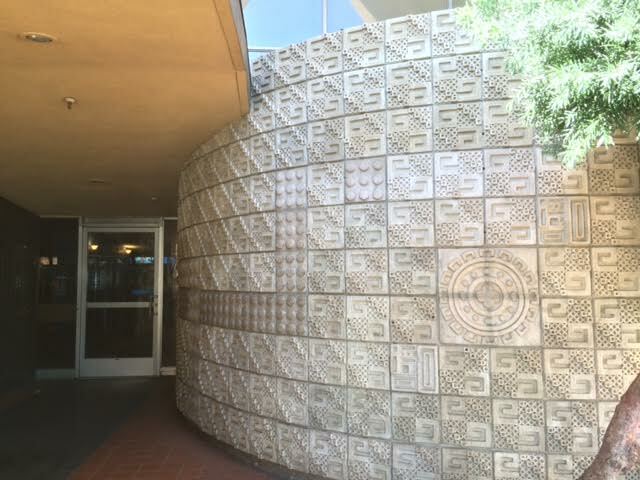 The art above the pins depicting a stylized Art Deco skyline was a cute way to dress the place up. 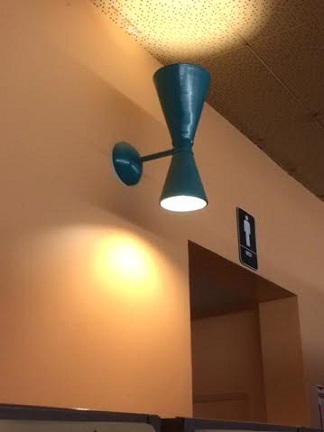 The balls weren’t so hot, though. In my range (10, 11 and 12 pounds), most had too-small holes, and the one I settled for scraped my thumb — waah, waah, waah. There were a lot of 14- and 15-pounders, which tempted me to move up except that my arm might have fallen off. The scoring system worked fine and the screen graphics were good. 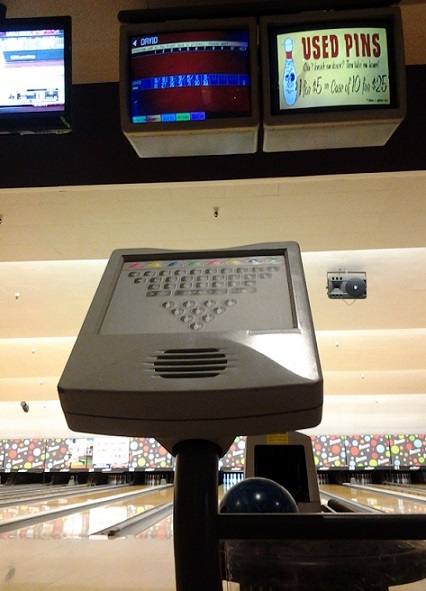 After whiffing on the second ball in a frame, the screen showed animated pins guffawing silently at me. Deflating, but I couldn’t help but join them. 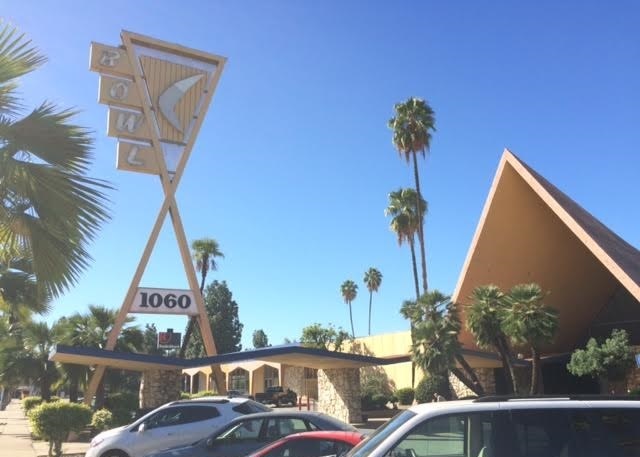 Covina Bowl is one block off the main drag, cutting down on its visibility, and you can tell from the enormous footprint, nearly a square block of land, that the pin palace was once a center of community life. 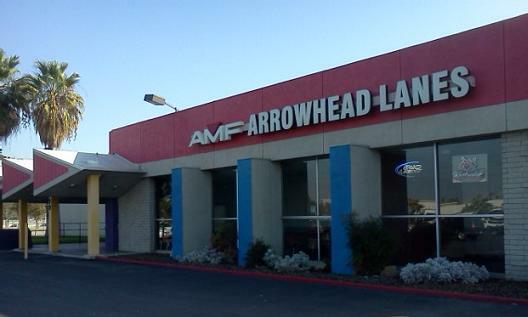 These days, not so much, and its days as a bowling alley may be nearing an end. 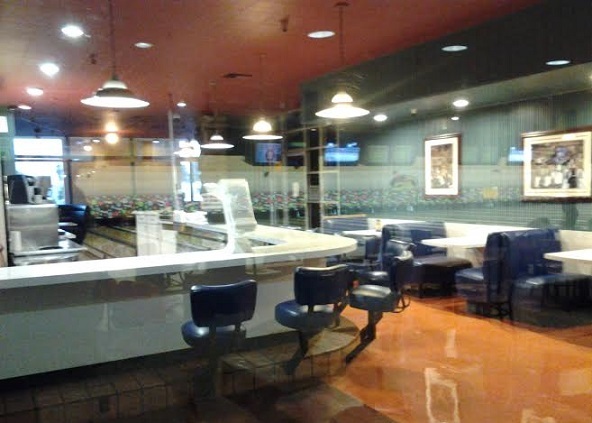 Enjoy Covina Bowl while it lasts. 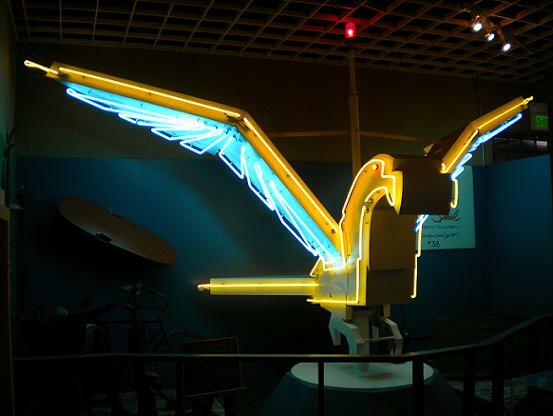 There are decent places to eat nearby: a Northwoods Inn of a similar vintage, several Mexican restaurants, Capri Deli a couple of miles east and a Norms in a round building (a former Steak Corral “family westaurant”) with an amazing sign that lights up in sequence. Hours: 10 a.m to 11 p.m. Monday, 9 a.m. to 11 p.m. Tuesday, 4 to 11 p.m. Wednesday and Thursday, 10 a.m. to 1 a.m. Friday and Saturday, 9 a.m. to 11 p.m. Sunday. 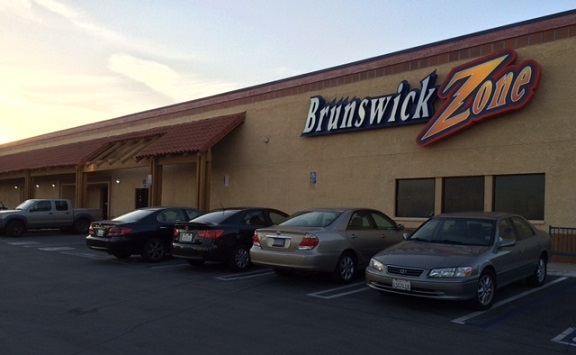 Upland’s bowling alley is relatively modern and located on the busy commercial corridor of Foothill Boulevard, just west of Euclid and cater-corner from Upland High, a recipe for success. 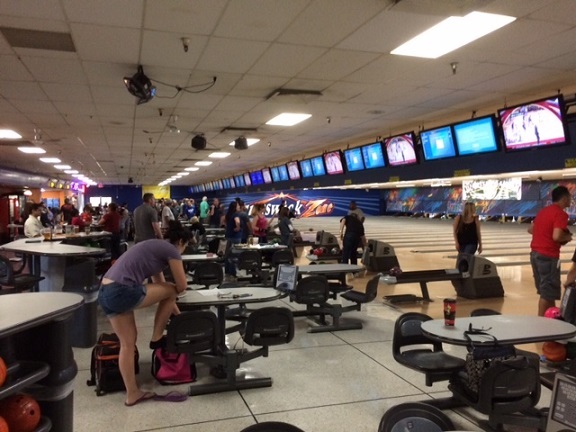 At 40 lanes, it’s about as large as they get. 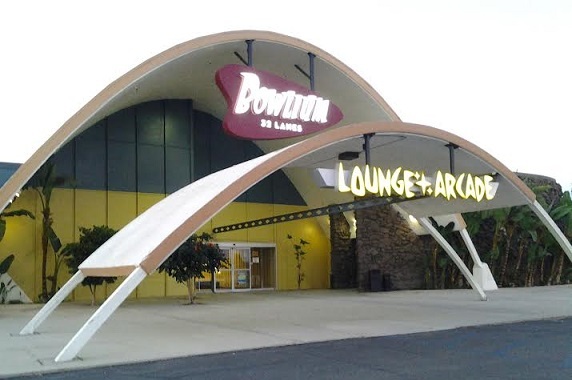 I’ve bowled there a bunch of times, and while it doesn’t have the flair of Montclair’s Bowlium, it’s a little easier to get to for me. 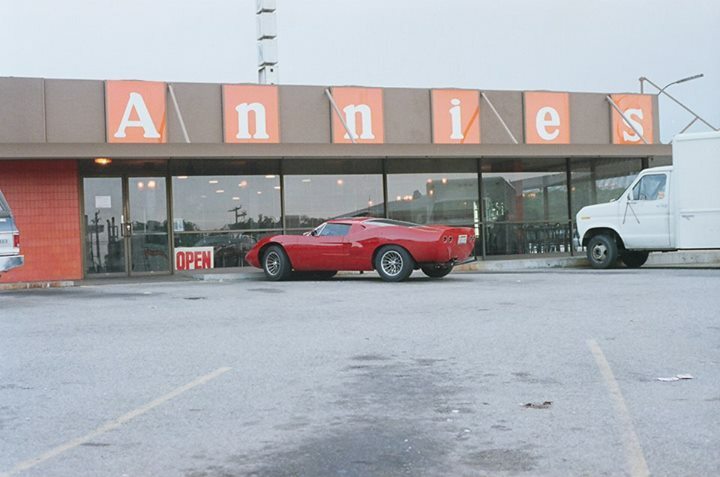 It’s my go-to bowling alley, and the place where I hit my high score, 200. One user-friendly touch is that all balls of the same weight are the same color, making them easy to sort for the staff and to return after you’re done. 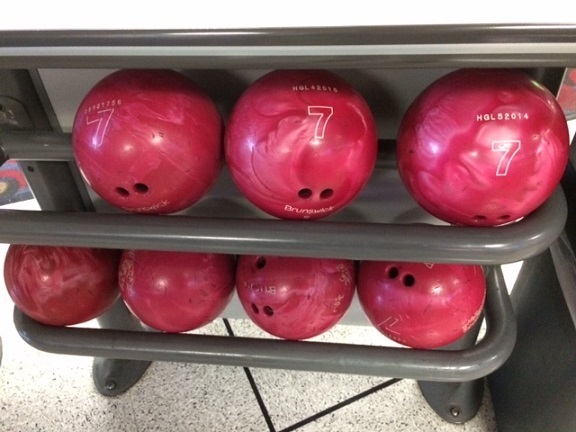 Anyone who’s spent time poking around the shelves for a ball of their favored weight will appreciate the ease of finding a ball: Here are all the 7-pounds, next are all the 8-pounds, organized in order up to 16. My favored weight, 10 pounds, are all green. The lane furniture is a little uncomfortable, with swing-out swivel chairs, and as with most electronic scoring systems, entering your name or making changes is tricky, maybe more so here with colored pyramid keys that correspond to elements on the overhead screen, once you figure it out. The graphics on the monitors are funny. 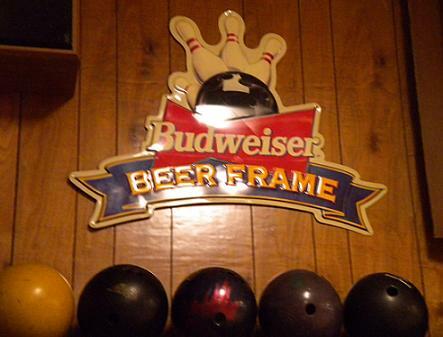 For instance, anthropomorphic pins walk out of jail when you roll a gutter ball. 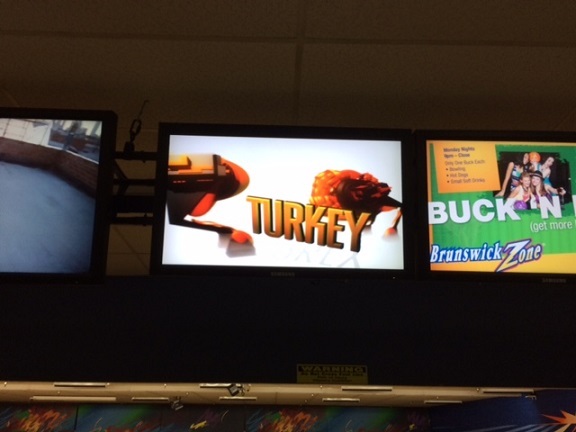 The “turkey” graphic below memorializes my getting three strikes in a row, a rare feat for me. On my most recent visits, the monitors were measuring your rolls’ speed (10 to 13 mph for me) and only showing the last five frames instead of the whole game at once. 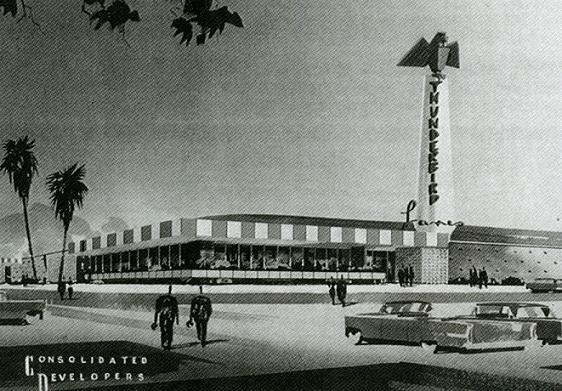 Upland is probably due for an update; in 20 more years we might think it’s retro, but at this point it just seems a little behind the times, and the exterior is awfully bland too. 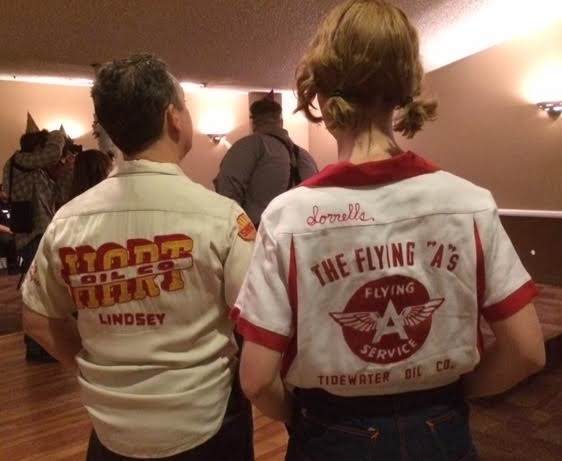 But while the Dude, Walter and Donny from “The Big Lebowski” would probably find the place too anonymous, Brunswick Zone is a good place to bowl. Coffee shop: No, but Nathan’s hot dogs. And salads. 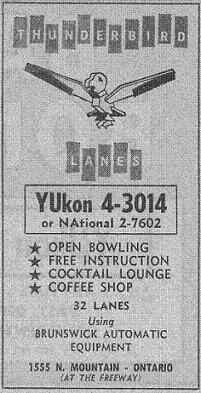 Deal: $2 Tuesdays, with games and shoe rental $2 each after 8 p.m.
Once you’re upstairs, you find billiards, a bar and eight lanes that evidently were last remodeled in the mid-1950s. 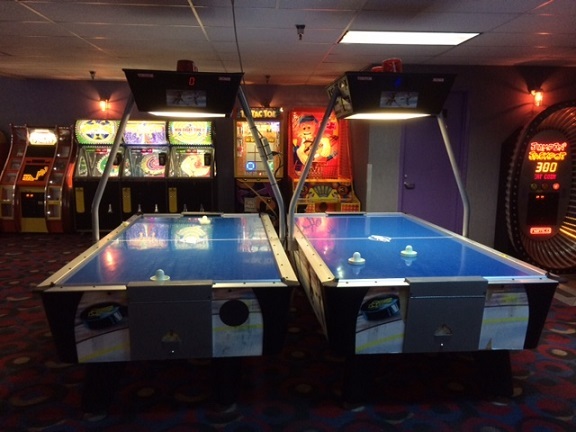 There’s automatic pinsetting and ball return — at least they don’t still employ pinboys — but the ball return is ancient and all scoring must be done by hand, just like the old days. No TV screens, no flashy graphics. Also, the seating is lovably plastic, and they still have ashtrays. 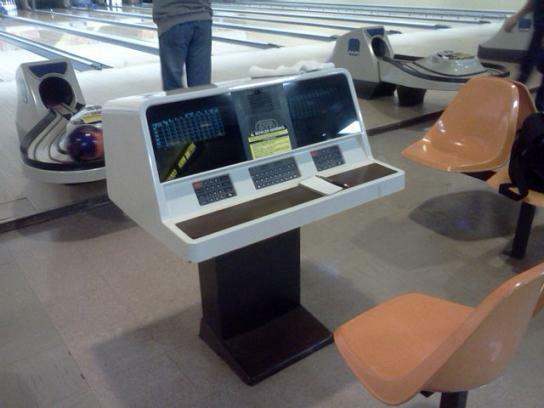 I learned how to keep score from my Dad back in the 1970s, before our town’s lanes implemented electronic scoring. Saratoga’s daytime manager told me that newcomers freak out about the scoring and sometimes stay away for that reason, but he always offers to show people how to do it. 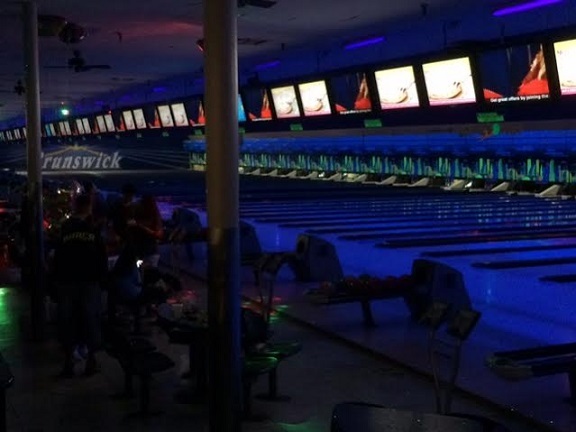 An occasional bowler, I’d been to Saratoga once before and found the place amazing. I returned during my recent visit home. 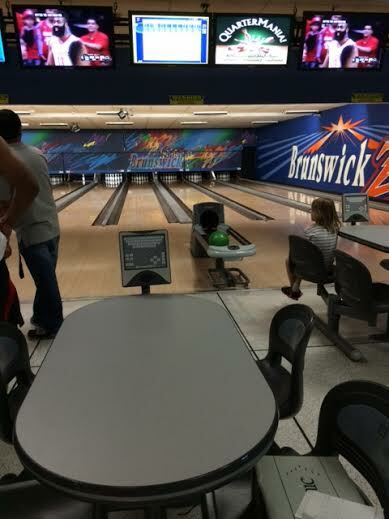 I was the only bowler there that afternoon. 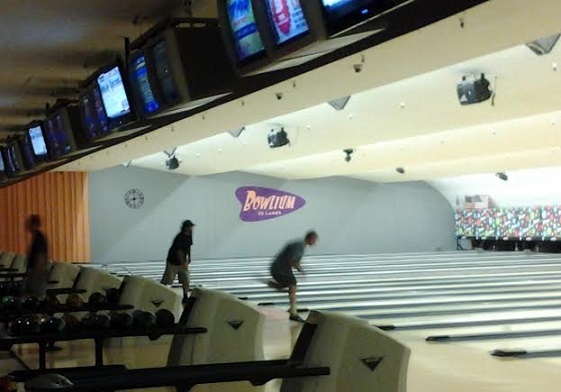 My parents watched me bowl three middling games — my scores were 127 to 144 — and my Dad took a video of me bowling a random frame. You can watch that video here. 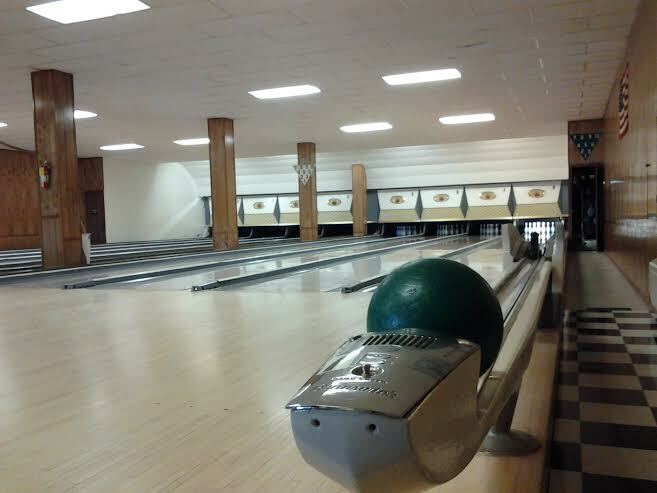 Saratoga is on the National Register of Historic Places and in 2008 was named the city’s best lanes by Riverfront Times. I’d link to Saratoga’s website, but it’s so minimal it may not have been updated since the 1950s either.